Attn: Online Business Owners… Are you actually happy with your website hosting company? Your whole working day should be devoted to growing and developing your online business – NOT worrying about your website hosting. That’s where we come in. Entrecloud is a concierge-style website hosting platform built just for online business. We are the simplest, most secure, and fastest website hosting platform on the web today. "As a high volume publisher, we strive for fast websites that effortlessly weather traffic spikes and maintain high availability. Since switching to Entrecloud in 2015, our days of dealing with nightmare hosting situations are over. The support and uptime Entrecloud has provided has been nothing short of top-notch!" On average we sped up each of Mike’s 11 wordpress content sites by 2.3sec each! > Pain-Free Site Migrations (With No Downtime). Hosting your sites on Bluehost, GoDaddy, or WPEngine? No problem. EntreCloud technicians (real humans!) will move your sites to our platform – with zero cost, zero downtime. > Create New Sites With One Click. It really doesn’t get any easier. Give us your new domain log-in and we’ll create a new optimized WordPress site for you. > Optimize Speeds & Protect Your Conversion Rates. Conversion rates increase 7% on average for every 1.0-second drop in page load time. We guarantee your pages will load at least 1.0 second faster. And we give you the tools to keep improving loading speeds for all your pages. > Seamless Publishing & Secure Testing. Never worry about breaking your site again. With Entrecloud, all your editing and testing is done inside of a protected “dev site”. Publish only when you’re ready, with 100% confidence. > Best-On-The-Web Backups & Data Security. Other hosts tout weekly or monthly backups. If you get hacked, you could lose all your data from the past week… Or more. Unacceptable! ESPECIALLY if you’re running an online business. Your Entrecloud site is backed up on the hour. If something does break, you can quickly restore the last working version. > Add/Remove Developer Access. 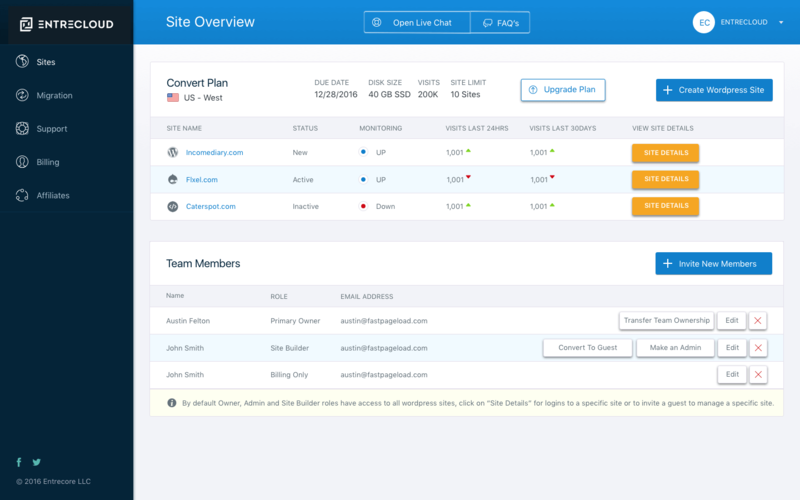 Quickly onboard new team members and developers with appropriate access permissions. See everyone who has access to your sites. Remove access permissions if and when when you need to. All brand names are trademarks of their respective owners. All plans and options listed are what have been publicly disclosed as of November 01, 2016. Comparisons are based on web hosting plans with similar features. "Entrecloud came through in a HUGE way by making our migration process super quick and totally painless at a very important point in our project. They migrated over 100 of our sites in 2 days!" "When we launch a new product or marketing campaign I never have to worry about our servers crashing, the support we receive from Entrecloud is amazing. A hosting company that actually gets our business!" "Working with Entrecloud has been a total “hands-off” experience. After you set it up, it pretty much runs itself. Their support is quick to respond. We highly recommend Austin, his team and the Entrecloud service!" If you don't LOVE our service let us know within 30 days and we will give you 100% of your Money-Back AND migrate you to the host of your choice for free. We are FAST, so fast that we guarantee that EVERY site you move to Entrecloud will be at least one second faster. If for whatever reason your site is not faster our team will optimize your site manually for FREE.